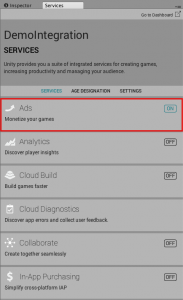 This guide will instruct you step-by-step on how to set UnityAds live as an Ad Network on the ironSource Mediation platform. Create an account with UnityAds. You can do so here. 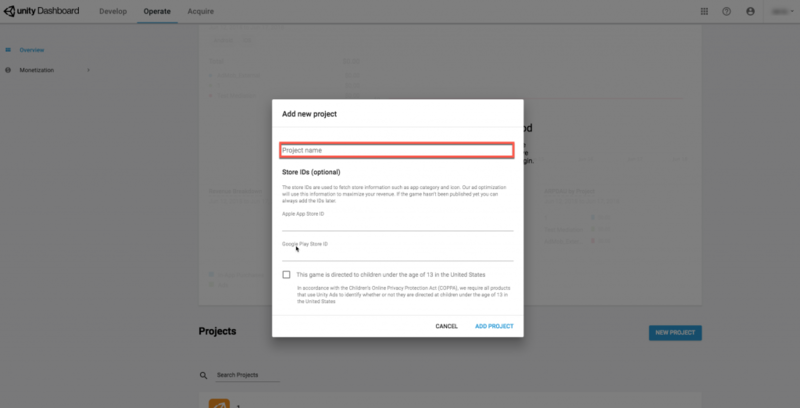 Name your new project and enter the store IDs you wish to publish on (Apple App Store or Google Play). If the game hasn’t been published yet you can always add the IDs later. Note: You will need a unique UnityAds application per platform (iOS + Android) just like you do with your ironSource account. Check Rewarded video to make the ads displayed through this Placement unskippable. Select the ad Type to display through this Placement (currently, Video is the only option). Name the Placement. The Placement ID, which you call in your code implementation, automatically populates based on your entry. Check mute audio if you want the ad to default to muted audio. If you did not check Rewarded video, you can specify the number of seconds to Allow skip after for ads displayed through this Placement. Game ID This is the unique identifier of your Application in UnityAd’s system. This is the unique identifier of your Ad Placement in UnityAd’s system. Two Ad Placements are created by default for your application; a Rewarded and Non-Rewarded placement. This is a unique identifier for your UnityAds account, which allows your ironSource Mediation Platform to import performance data from your UnityAds account to use in reporting & optimization. Once you obtain this information, you must configure UnityAds Parameters in your ironSource Account. By adding the above information correctly, you will be able to take full advantage of UnityAds’ ad inventory and reporting data on ironSource’s Mediation platform. 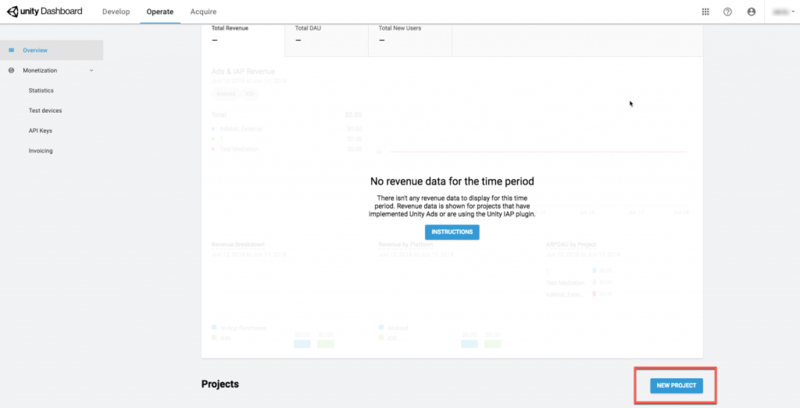 Navigate to the main monetization dashboard and click on API KEYS. You will then see your API Key. Once you have all of these parameters, log in to your ironSource account. Go to ‘Monetize‘ ➣ ‘SDK Networks‘ ➣ ‘Available Networks‘. 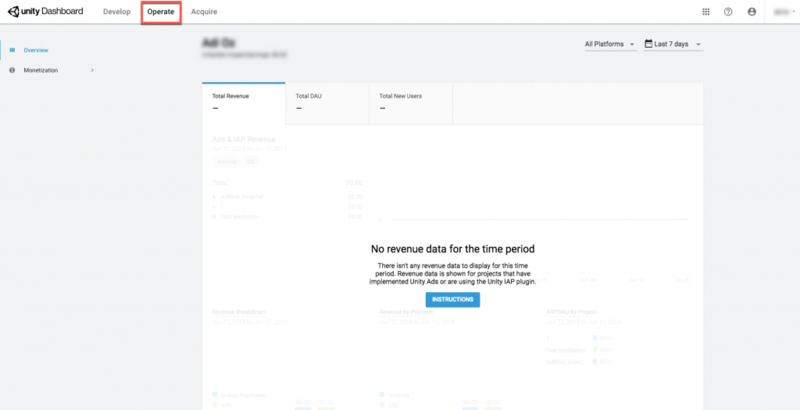 Select UnityAds from the list of available Ad Networks and input the UnityAds ‘API Key‘ in the relevant fields. Make sure you choose the app you want to integrate from the apps list on the left side of the SDK networks page. You will then see UnityAds as Active for Mediation on your Setup Dashboard. Note: The Unity Plugin for UnityAds currently supports Video Ads only. Add the UnityAds Adapter to your build. 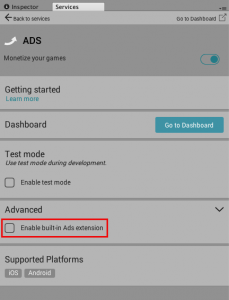 You can find the latest UnityAds Adapter here. To add the Adapter, simply double click on the IronSourceUnityAdsAdapter_[version].unitypackage and add all files to your Unity project. Note: If you are upgrading from a previous version, please remove unity-ads.aar from Assets/Plugins/Android. Note: The Unity Plugin for UnityAds currently supports only Video Ads. Import the IronSourceUnityAdsAdapter_[version].unitypackage to your Unity project. You can find the latest UnityAds Unity Package for Unity here. Note: If you are upgrading from a previous version, please remove unity-ads.bundle from Assets/Plugins/iOS/IronSource. Note: if you are using Facebook Audience Network’s server-to-server callbacks and are leveraging the DynamicUserID parameter to verify AdRewarded events, you will see this parameter reflected in their server-side callbacks. In addition, you can also see this parameter in the ironSource server-to-server callbacks. You are now all set to deliver UnityAds Ads within your application!